For 55 years, American singer/songwriters have graced the stages of the Newport Folk Festival in Fort Adams State Park for a three-day weekend of folk and Americana music, food and crafts. 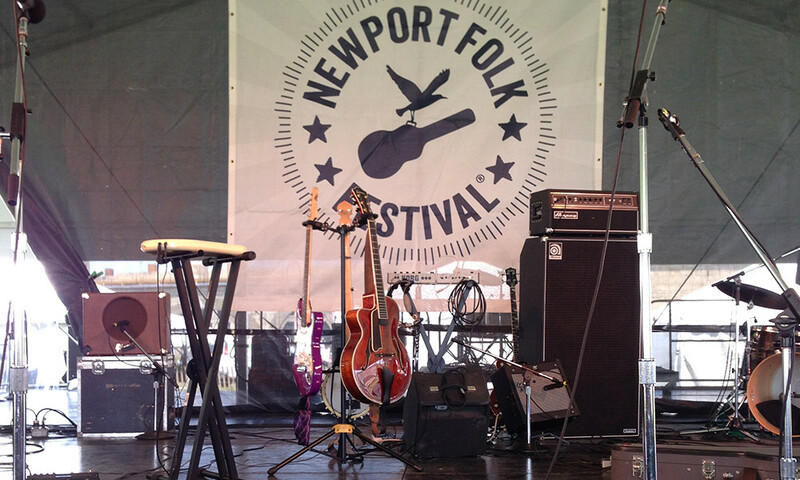 Over its storied history, the Newport Folk Festival has traversed the Americana music scene from Pete Seeger to Jack White, pushing boundaries and challenging festivalgoers’ perspectives on what is American folk music. Attracting thousands of music lovers from near and far, the Newport Folk Festival was a natural third stop on The Rhode Yacht’s summer road trip across New England. So far, the Rhode Yacht has proved how easy to clean Sunbrella fabric is, even against kids brandishing ketchup and chocolate sauce. The Rhode Yacht then traveled to the 2014 Vineyard Cup to cheer on the crew of The Real Yacht, a luxury M36 daysailer by Morris Yachts, as they participated in three days of friendly competition on the water. Back at the Newport Folk Festival, The Rhode Yacht offers a place to unwind after a long of day of dancing, singing along to the music and supporting worthy causes such as Save the Bay and The Fort Adams Trust. Outfitted with a luxury yacht interior featuring cheerful fabrics in bright oranges and blues from the Sunbrella Carousel Stripes collection, The Rhode Yacht epitomizes the carefree attitude of the music festival. As the sun sets over Newport Harbor, The Rhode Yacht soaks in the panoramic views of the Newport Bridge and the East Passage as chords and melodies from songs heard during the day, like this one from Conor Oberst, float through the summer air. The Rhode Yacht and its tour across New England is part of Perspective New England, a design journey exploring the versatility of Sunbrella fabrics for every aspect of your life—at home, on the water or on an adventure. Be sure to watch The Rhode Yacht, The Real Yacht and The Beach House come to life with Sunbrella fabrics by visiting the episodes page. Follow the entire project on Twitter and Instagram @Sunbrella and #PerspectiveNE.